Cacao, commonly known as cocoa, is used to describe both the unprocessed beans that are used to make chocolate and the tree they come from. Bitter chocolate is produced by pressing roasted cocoa kernels (seeds) between hot rollers. Cocoa powder is produced by squeezing the fat (cocoa butter) from bitter chocolate and powdering the remaining material. Sweet chocolate is produced by adding sugar and vanilla to bitter chocolate. White chocolate contains sugar, cocoa butter, and milk solids. The word "cacao" comes from the Olmec civilization that preceded the Mayans in the southern Gulf of Mexico. The common synonym "cocoa" is actually a misspelling of the original word. The Theobroma cacao tree is found in the Amazon forests as well as in other tropical regions. It produces three types of beans, which are the Criollo, Forastero and Trinitario. All are used to create chocolate and offer distinct health benefits. Theobroma cacao is native to South America, growing naturally in the Amazon River Basin as well as the Orinoco River Basin. It is also farmed in other areas such as Ghana, Indonesia and the Philippines. The tree grows from 10 to 30 feet (3-9 meters) in height and usually starts to bear fruit four years after being planted. The Theobroma cacao tree's fruit is known as cacao pods. When ripe, they are a hearty yellow or orange and weigh just about a pound. Each contains many seeds referred to as cacao beans. These seeds can be extracted and made into cocoa butter. This butter is a pale-yellow vegetable fat that is used to not only make chocolate but also pharmaceuticals, ointments and toiletries. The nib is found at the center of the bean. This is what is used to make chocolate. Nibs are rich in antioxidants as well as good fats and minerals such as calcium, zinc, iron and potassium. They have a byproduct similar to caffeine and produce a natural MAO inhibitor that can suppress overactive appetites. The Criollo species of the bean is the rarest and most costly with only 10 percent of chocolate cultivated from this type. The taste isn't as bitter as other types of beans and the scent is more aromatic. This species is harvested mainly in Colombia, Ecuador, and Venezuela. Forastero beans are used in 75 to 90 percent of the world's chocolate. They are often referred to as bulk beans because of their predominant use in chocolate production. The term Forastero means foreign in Spanish. Trinitario beans are a hybrid of Criollo and Forastero and are used in about 10 percent of chocolate. Fermentation of the beans takes three to seven days. This is necessary to develop the beans' flavors and prepare them to be roasted. In the process, sugars in the beans get converted to alcohol and germs are killed. Cocoa health benefits are more than what you can imagine. Cocoa health benefits have stunned many chocolate eaters all over the world. The color, the taste, the aroma, plus the additional cocoa healthy benefits have made it one of the most appreciated remedies for chocolate lovers. However, cocoa health benefits are seen only if it is consumed in right and moderate proportions. Long regarded as a food treat, cocoa is now used by some people as medicine. Cocoa seed is used for infectious intestinal diseases and diarrhea, asthma, bronchitis, and as an expectorant for lung congestion. The seed coat is used for liver, bladder, and kidney ailments; diabetes; as a tonic; and as a general remedy. Cocoa butter is used for high cholesterol. Some people apply cocoa butter to the skin to treat wrinkles and to prevent stretch marks during pregnancy. You've might have heard the buzz about the possible heart health benefits of chocolate, especially dark chocolate. In fact, the candy company Mars, Inc., plans to seek a health claim for chocolate from the Food and Drug Administration (FDA) in the next few years based on research they sponsored regarding the potential role of cocoa flavonoids in cardiovascular health. Flavonoids are chemicals that might lower blood pressure. Dark chocolate contains more flavonoids than milk chocolate or white chocolate. Studies have shown, that cocoa, if consumed in prescribed quantities, lowers high blood pressure. However, these are dark cocoa health benefits or unsweetened cocoa health benefits. Cocoa contains flavonoids, which brings about reduction in systolic and diastolic blood pressure. Polyphenols, in cocoa powder or in the cocoa seeds, also helps in the keeping cardiovascular diseases at bay. However, those of you, who are inspired by the health benefits of cocoa, understand that, only limited bites (30 calories) is recommended as part of the high blood pressure diet. So, savor those bites of dark chocolate. For treating high blood pressure: 46-105 grams/day of dark or milk chocolate, providing 213-500 mg of the active ingredients, cocoa polyphenols. Cocoa health benefits include a cure for facial skin problems too. Constant exposure to sun causes pigmentation, dark spots and all in all, damages the skin. Again the high-flavanol content in cocoa, helps in premature aging, smoothens outs the roughness, and is more tolerant to ultra-violet radiation than any sunscreen. 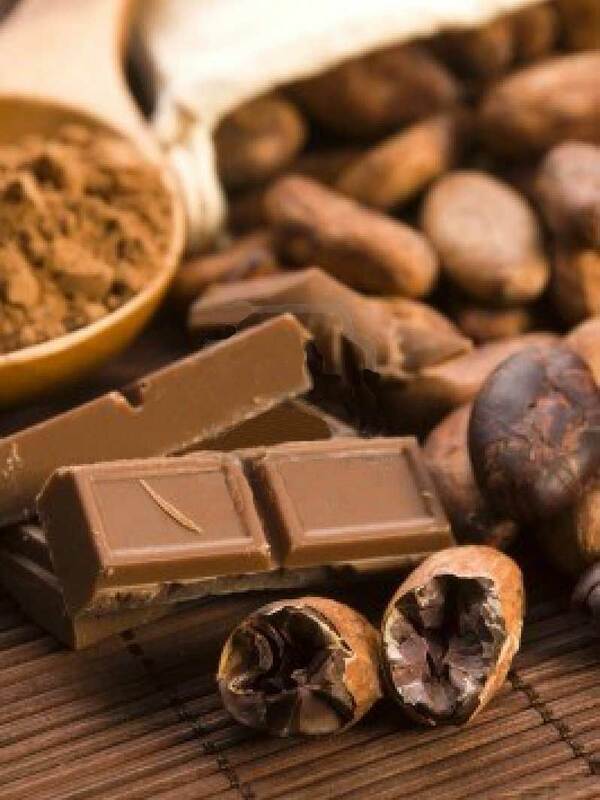 Some studies also show that cocoa, might be anti-cancerous in nature, thus preventing skin cancer. Thus, following a diet which is rich in flavanol, will ensure healthy skin. Organic cocoa health benefits stretch to antioxidants too. Cocoa contains phenolic compounds, like red wine and green tea. On the plus side, cocoa is known to have higher amounts of antioxidants, than any tea or wine. Polyphenols are a type of antioxidant, which help in keeping the skin younger and detoxifying the body. However, drinking cocoa is much better than eating a bar of chocolate, as the latter contains saturated fats, which nullifies cocoa health benefits. Depression drugs are available for treating depression. However, all of these drugs cause some harmful side effects. On the other hand, cocoa is a great anti-depressant, which has no side effects. Polyphenolic extract, which is derived from non-roasted cocoa beans has high levels of flavonoids. This extract, helps is treating depression. Cocoa health benefits, can be maximized, if you drink it, rather than eat it. Getting pure cocoa health benefits is possible without using sugar. Hence avoid sweetener in any form, as sugar in any form will reduce the benefits, so, do refrain from adding it to your cuppa hot chocolate. So, go make yourself a cup of hot chocolate, to cheer up, or just to explore its health benefits. Eating cocoa is LIKELY SAFE for most people. Cocoa contains caffeine and related chemicals. Eating large amounts might cause caffeine-related side effects such as nervousness, increased urination, sleeplessness, and a fast heartbeat. Cocoa can cause allergic skin reactions, constipation, and might trigger migraineheadaches. It can also cause digestive complaints including nausea, intestinal discomfort, stomach rumbling, and gas. Cocoa butter used on the skin appears to be safe for most people. It can, however, cause a rash. Pregnancy and breast-feeding: Cocoa is POSSIBLY SAFE in pregnancy and during breast-feeding when used in moderate amounts or in amounts commonly found in foods. But be sure to monitor your intake. Cocoa in larger amounts is POSSIBLY UNSAFE because of the caffeine it contains. Caffeine found in cocoa crosses the placenta producing fetal blood concentrations similar to the mother's levels. Although controversial, some evidence suggests that high doses of caffeine during pregnancy might be associated with premature delivery, low birth weight, and miscarriage. Some experts advise keeping caffeine consumption below 200 mg per day during pregnancy. Keep in mind that chocolate products provide 2-35 mg caffeine per serving and a cup of hot chocolate provides approximately 10 mg.
Caffeine is also a concern during breast-feeding. Breast milk concentrations of caffeine are thought to be approximately half the level of caffeine in the mother's blood. If the mother eats too much chocolate (16 oz per day), the nursing infant may become irritable and have too frequent bowel movements because of the caffeine. Anxiety: There is a concern that the caffeine in large amounts of cocoa might make anxiety disorders worse. Diabetes: Cocoa seems to be able to raise blood sugar levels and might interfere with blood sugar control in people with diabetes. Diarrhea: Cocoa contains caffeine. The caffeine in cocoa, especially when taken in large amounts, can worsen diarrhea. Irritable bowel syndrome (IBS): Cocoa contains caffeine. The caffeine in cocoa, especially when taken in large amounts, can worsen diarrhea and might worsen symptoms of IBS. Gastroesophageal Reflux Disease (GERD): Cocoa seems to hinder the effectiveness of the valve in the food tube (esophagus) that keeps the contents of the stomach from coming back into the food tube or the airway. This could make the symptoms of GERD worse. Migraine headaches: Cocoa might trigger migraines in sensitive people. Surgery: Cocoa might interfere with blood sugar control during and after surgical procedures. Stop eating cocoa at least 2 weeks before a scheduled surgery. Rapid, irregular heartbeat (tachyarrhythmia): Cocoa from dark chocolate can increase heart rate. Cocoa products might also make irregular heartbeat worse. Benedict XVI deny the Catholic Faith teaching that false religions saves! Real Ghosts Attack People On Camera! John Paul II taught that false religions is from God! The Most Terrifying Demons Attack People On Cam! Atheism destroyed: Creation VS Evolution Debates and more! Paul VI denied the Catholic Faith by propagating false religions exposed! We are looking for translators in all the languages of the world. Click here! Benedict XVI denies the Catholic Faith teaching that false religions saves! Receiving sacraments from heretics is a mortal sin! Copyright information: All our articles are free to copy and share. Please remember to also include live links to the source of the information obtained. We are looking for translators who have the skill to make a good translation of important articles for the salvation of souls. We are also in need of translators who can translate Saint Bridget's Revelations into different languages. If you can help us on this important work, please contact us here. We need your help! If you like our material and want to enlighten others about it, please pray for us and help spread our material in order to help our non-profit ministry. Please donate today. Any donation that you can give is highly appreciated and much needed! Help us help our beloved brothers' and sisters' souls. Your Support Counts! Please click here! WATCH &AMP; DOWNLOAD ALL OUR DVDs &AMP; VIDEOS FOR FREE! Except where otherwise noted, content on this site is licensed under the Creative Commons Attribution - Share Alike License. Please Download and Share our DVDs, Videos and Books in order to save souls!